Spring has sprung and with the increasing temperatures and seasonal rains, mosquitoes will soon be springing up too! Mosquitos are the main transmitters of heartworm disease – a serious and potentially fatal disease that can affect our pets. Heartworm disease is caused by worms that live in the pulmonary vessels (the vessels that carry blood to the heart and lungs) of infected pets. 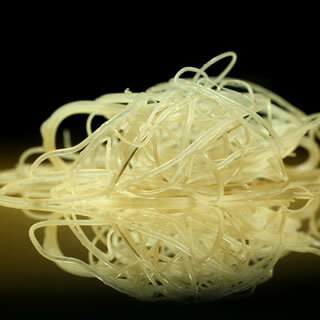 These foot-long worms (They look like strands of spaghetti –gross!) can cause severe lung disease, heart failure, and damage to other body organs. 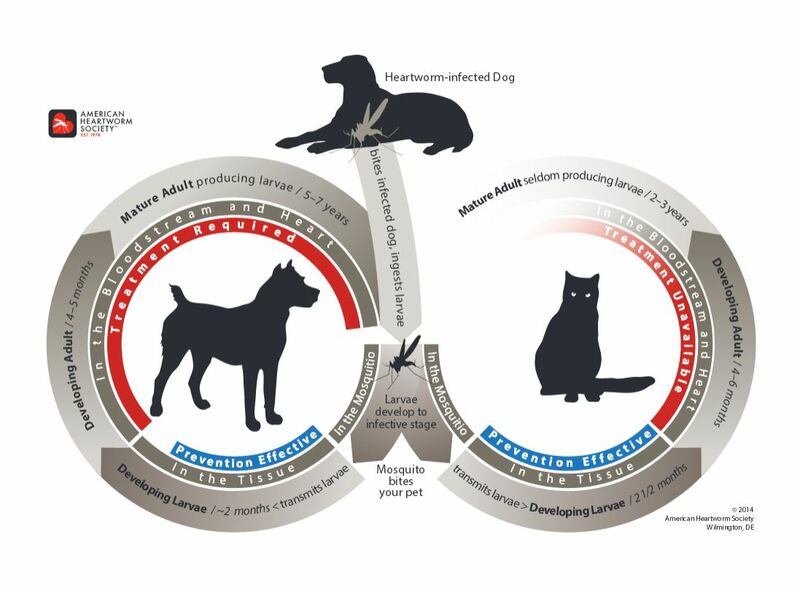 Heartworm disease affects dogs, cats, ferrets, and other non-companion mammals including wolves, coyotes, foxes, and sea lions. Foxes and coyotes are considered important carriers because of their potential to live in close proximity to humans and their pets. This map shows the incidence of heartworm-related cases across the United States in 2016. The American Heartworm Society gathers data on heartworm testing every three years to understand the impact heartworm is having nationwide, as well as in specific regions. Heartworm incidence is increasing. 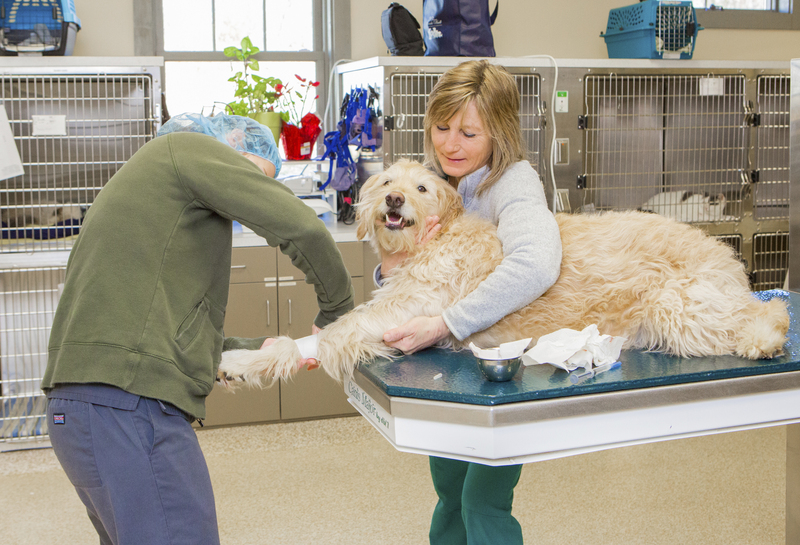 Since the last survey in 2013, there has been a 21.7% increase in the number of heartworm cases per clinic. As you can see on the map, the highest cases are in areas near water, along the shore, the bay, the gulf coast area, and following the Mississippi River. With it’s muggy climate and closeness to major waterways, the Northern Virginia ranks in the mid-to-high levels of heartworm incidence. Remember though, standing water of any kind (like puddles, in gutters, even in outdoor pet bowls) are breeding grounds for mosquitos, putting our pets at risk when they venture outside. Testing data from thousands of veterinary practices and shelters is used to create a detailed map showing the average number of heartworm-positive cases per clinic. Heartworm incidence is increasing. Since the last survey in 2013, there has been a 21.7% increase in the number of heartworm cases per clinic. One of the most common signs in both dogs and cats is no sign at all until the disease has well progressed. Some advanced symptoms include asthma-like persistent coughing or difficulty breathing, fatigue or lethargy, decreased appetite, and weight loss. Dogs harboring large numbers of heartworms can have sudden blockages of blood flow to the heart, causing cardiovascular failure. 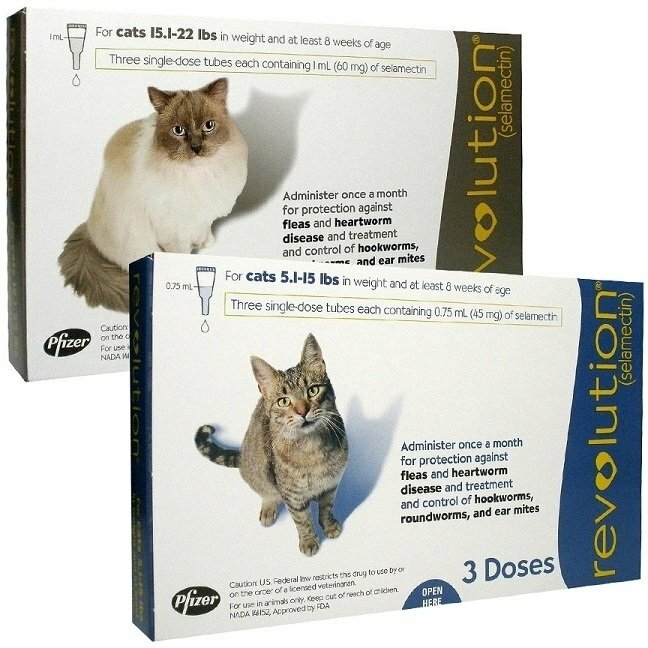 Cats can also have severe lung damage, resulting in sudden collapse or sudden death. As you can see, by the time symptoms set in, prevention and treatment is usually too late. The medical work-up and treatment for heartworm disease in dogs is very expensive, painful, and requires strictly resting the pet for several months to limit the risks of complications (and complications can be very serious in some pets). The diagnosis is much more complex in cats. Currently, there is no treatment and medical management is very expensive and challenging. Because there are so few early signs of the disease, routine testing to detect heartworms is very important. For dogs, we recommend an annual blood test performed during your pet’s yearly exam. This simple test requires just a small blood draw and is processed in LVH’s in-house lab. In many instances, we can give you the results before you leave. (As a bonus, this blood test also screens for three tick-borne diseases – Lyme, Ehrlichia, and Anaplasmosis). It is also important for your veterinarian to ensure your pet does not have heartworms before beginning or renewing a preventative prescription. Administering preventatives to a heartworm positive pet can have severe or even fatal medical complications. It takes months for dogs with heartworms to test positive (Remember, it takes six months for the infective larvae to mature to adult heartworms) so your pet may have been infected with larvae at last year’s exam but did not read positive on that test. For more information on the benefits and importance of annual heartworm tests, download this great handout from the American Heartworm Society’s website. 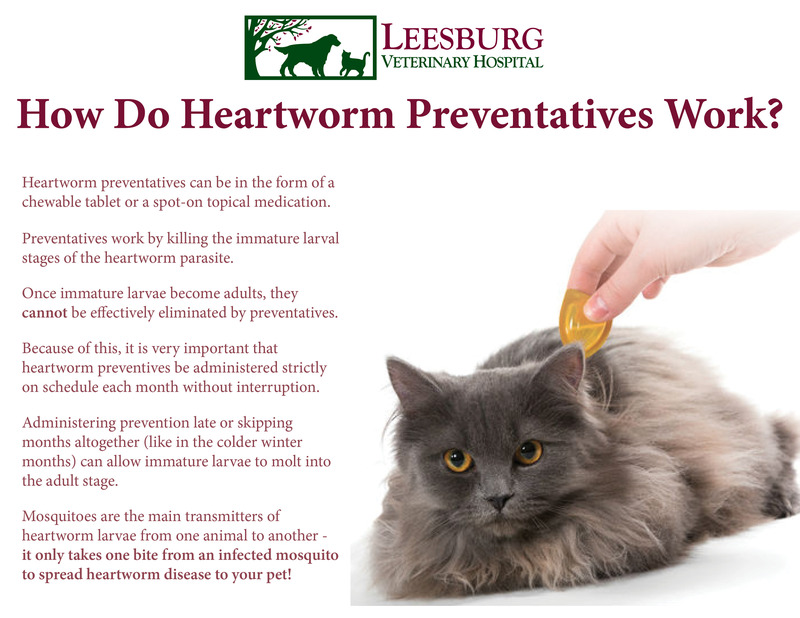 At Leesburg Veterinary Hospital, we recommend the following preventatives for dogs and cats, Remember, it’s less expensive to prevent heartworms that to treat them! Dogs: Sentinel Chewable tablets. A meat-flavored, chewy tab that not only protects against heartworms, but provides protection against intestinal parasites including whipworms, hookworms, roundworms, and tapeworms. Ideally, it’s best to renew your pet’s heartworm preventative during their annual exam. Not only does this keep you on track (your pet should be due for their refill!) but it gives you the opportunity to discuss with your vet how your pet is doing on the medication. We hope this article provides some clarity on heartworm disease and the importance of prevention. Again, if you’re looking for more information, please check out the American Heartworm Society’s site, in particular, the bottom of this page has a great commonly asked question and answer section. Your veterinarian can also discuss any questions you may have at your next appointment.